My laptop is currently repairing itself having completely frozen earlier so I have none of my camera images from today, but I do have some iPhone ones to put in for now – I will update the photos once (fingers crossed) my laptop has repaired itself! Read on for our Butlins Bognor Regis Review – Day 4! We had a lie in this morning – 6:45 (yes to us that’s a lie in!). We had a lovely breakfast at The Shoreline Hotel then Mr H took Miss H to see the puppet show while I went for a little tour of the site with my camera! Yes I know I was dubious but she was over the height limit and desperate to go on it so Mr H (aka fun daddy) took her on it! We then went for a lovely lunch at The Beachcomber Inn; Miss H thoroughly enjoyed her tomato soup and cheese sandwich! (In toddler land that’s a perfectly acceptable food combination by the way ?). Next up it was the part I was most looking forward to; a 35 minute spa treatment. I had a tailor made massage and after a busy week with lots of walking I chose a back, neck, shoulder & feet, the treatment was amazing I am sure I fell asleep at one point! Whilst I was having my treatment Mr H and Miss H went to watch Mike The Knight! They assured me it was a great show although Miss H was disappointed it didn’t have rainbow (the Skyline gang dog) in it ? After my massage I felt a little sleepy, Mr H was shattered and Miss H (haha you thought I was going to say tired didn’t you – not a chance Miss H doesn’t do tired!) she wanted to watch Mama Mia & play with her toys so we went back to the room for a little relax. We took Miss H to see Aladdin rocks, but she didn’t like the genie and widow Twankie – she was scared so we left, Daddy took Miss H to soft play and I had a nice hot drink in Costa! From soft play we went to music and movement in The Beach House – Miss H loved the dancing! Then we had time for a little relax before dinner so went back to the room for a little play. We went to The Shoreline Hotel for dinner; there was a really good selection of food and more importantly a great selection of desserts! The staff were a little slow clearing plates away at the end of courses. After dinner we went to the amusements and won loads of tickets; we will count them all up tonight and let you know what we get with them all tomorrow! Miss H then wanted to go to the tots disco; she bopped away to all her favourite nursery rhymes. 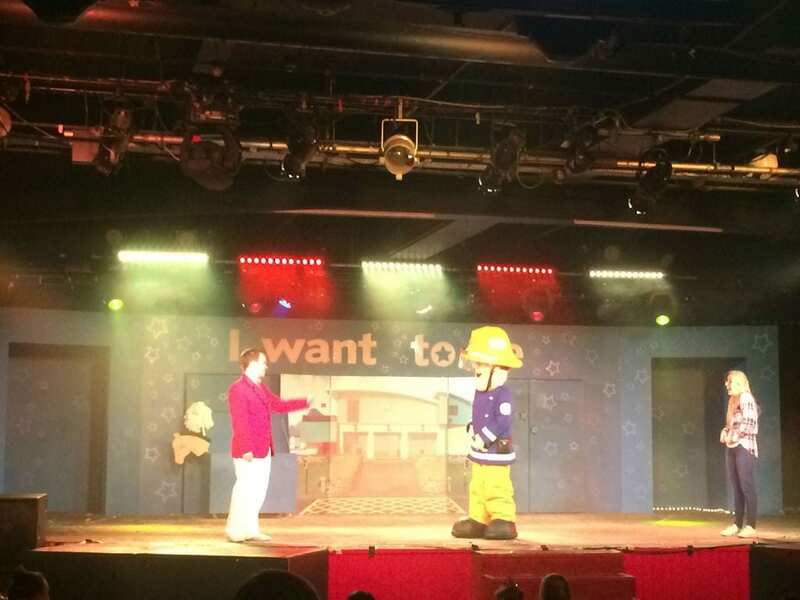 The show this evening was ‘I Want to Be’ and had Angelina Ballerina, Mike The Knight, Bob The Builder & Fireman Sam; Miss H really loved the show and is very sad to be leaving Butlins tomorrow! Disclaimer: We were given our accommodation and the premium dining package at Butlins free in exchange for a review; nonetheless our views are our own honest opinions.